It was raining this morning!! Finally I can actually see and feel that the weather is moving towards autumn and winter. Outside is bit windy, and cloudy now. I love it! In the weather like today, I feel like something warm for breakfast. This dish is what I made in the home economic class when I was in elementary school in Japan. The name of the dish was “Croque Monsieur”, so I still call it so. 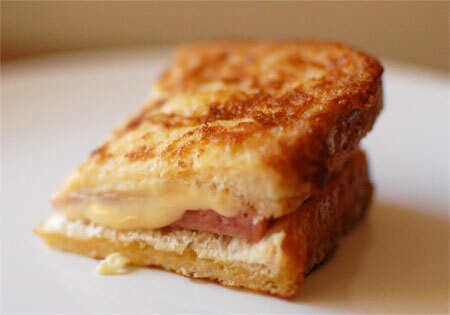 The original Croque Monsieur is actually a simple hot ham and Gruyere cheese sandwich, fried in butter. 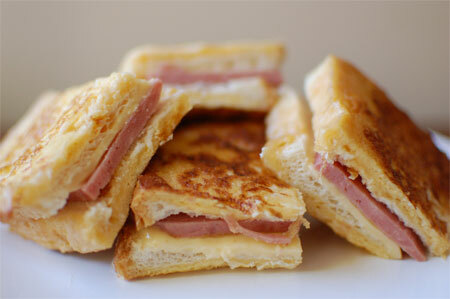 This one, on the other hand, uses spam instead of ham, and the sandwich is dipped in egg mixture before being grilled. Place spam and cheese on a slice of bread, and sandwich with another slice. Beat the egg, and mix with milk. Transfer the egg mixture into a shallow plate which is wide enough to put the bread in. Place the sandwich into the egg mixture to soak for about 30 seconds, then flip it around. Melt the butter in a frying pan, and grill the sandwich, both side, until golden.